Slice the onion and place into a pre-heated pan with the butter, oil and cook on a low heat for 30 minutes, keeping the lid on to retain moisture. The onions are ready when they have of gone transparent and gooey. Add 1 bottle of cider of Cornish cider to the onions and bring to a simmer for 2 minutes, stirring to get any residue of the bottom of the pan. Now stir in the double cream. Bring to a simmer and allow to reduce and thicken to desired consistency. This sauce can be made in advance which will allow the flavour to develop even more. When sauce is ready steam the prepared mussels. If any mussels have gaped open again give them a light tap. If the mussel closes up its still safe to use. Use a few centimetres of boiling water, or cider, in a large pan with a lid. Steam for 3-4 minutes, or until all the mussels have opened. 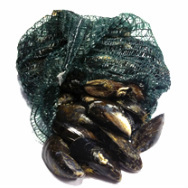 Throw away any mussels that have not opened. Stir into sauce and serve with crusty bread or chunky chips.